The endearing husband of my long-time hospice patient—I’ll call him Marvin—turned 90 earlier this month. His two daughters, who are roughly my age, mid 40s, organized a party for him, inviting family and friends. It was a festive gathering and I was again gratified to witness Marvin’s unflagging engagement with the world, something many aging seniors lose over time because of their isolation. Marvin needs a walker to get around, the kind that can be used as a seat when he gets tired. But he does get around, often lighting out from the apartment a few times a week for a walk in the park, a trip to the bank, or to pick up a couple boxes of his and his wife’s favorite crackers at the grocery store. These outings are vital to his sense of independence, to his mental activity and to his physical abilities. Nonetheless, a few visits ago Marvin told me that it can take him a half hour just to get his socks on. His ankles are constantly swollen. It is increasingly difficult for him to get out of low chairs. Use it or lose it means something profound to seniors who are closely bound to their homes. If they don’t make the gargantuan effort to continue any kind of physical activity, the ability to do so can quickly dissipate. Which is why winter has been particularly difficult for Marvin. Freezing temperatures can prevent an elder, unable to quickly scurry from door to door or to move freely in bundles of clothing, from getting any exercise at all. Snowy, icy, or slushy sidewalks present a particular obstacle to those whose feet are less agile or whose eyesight may not detect changes in the surface they are walking on. Marvin’s been kept inside the past few weeks by our harsh New York weather. He fears that he’s lost some of his stamina and mobility because of it. While his lack of mobility has specific consequences, namely decreased strength, my fear of his falling has kept me on tenterhooks during the ice and snow. What if he falls on the sidewalk and breaks a hip. No number of eager and helpful New York passers-by can stave off the challenges of recovering from broken bones. Few things can set back an elder’s health or decrease their longevity like a fall. 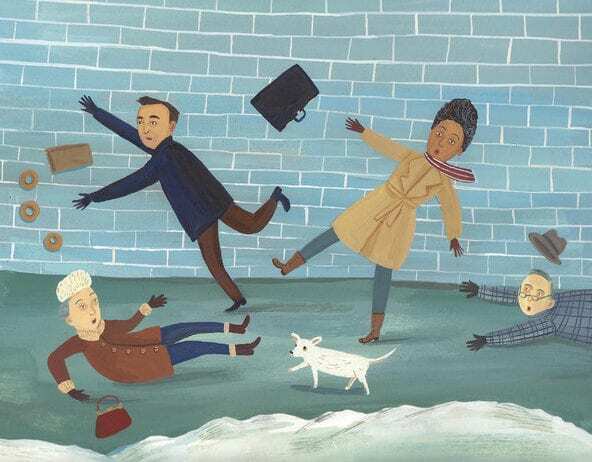 In her recent article for The New York Times, Jane Brody highlights the seriousness of falls for seniors: “About 40 percent in this age group [65 and older] fall at least once a year; one in 40 of them ends up in the hospital, after which only half are still alive a year later.” A fall for those of us under 50 can mean simple injuries—I fell twice this winter during my own morning walks and both times had a bruised bum to show for it—but for elders, a fall can cause serious physical set-backs, including death. “Falls are the leading cause of accidental death among seniors,” notes another New York Times article today about a new senior training program in Kansas. Brody and her friends counter falling, she writes, by slowing down, walking deliberately, and, on the advice of doctors, doing exercises like Pilates, physical therapy and tai chi that increase strength and balance. But not everyone has access to such classes or services—or even good advice from doctors. And even for those who do, classes can be a hard sell. Just the effort of getting out of the house to exercise with strangers is enough to deter most of us, let alone someone who needs half an hour to put on socks. Last year, according to a report in Preventative Medicine, researchers looked at ways to enroll seniors in such strength- and balance-improving classes by marketing them through churches. The study started with the premise that some of the obstacles to class enrollment are lack of familiarity, high costs and lack of transportation. By embedding the classes in a community that seniors were already comfortable with, their church, researchers were able to bypass some of these obstacles. The beauty of the study is that it addresses the needs of seniors in terms other than blame. So often we hear the medical community admonishing seniors for not walking more, not watching their diet, or not complying with doctors’ orders, shaming them for not making the necessary lifestyle changes that medicine paternally applies to them. Inherent in this “you should try harder” approach is an absence of discussion about how our social systems fail seniors, leaving them to molder alone in their homes, many without outside contact, close family or even health insurance. If the US had better home health services, seniors wouldn’t be shamed for not remaining active or for not taking all their medications on time—the responsibility to care for seniors would be on the total population, not on encumbered, declining seniors themselves. This study considers seniors’ needs where they are, in their existing environments, among the communities they’ve fostered and cared for their entire lives. It ingeniously examines their current routines and suggests ways to use it to enhance their health. Basing classes in churches makes great sense. A study from 2010 shows that most US churches have an older attending population (84% of churches have a population with 79% over the age of 34). Elders attending church have made communities within their congregations; aside from family and neighbors, their congregation may be most aware of their health and needs. Church can also be a hub for activities and engagement with the world. If they’re already attending regularly, creating resources for seniors within the church makes access much easier. Too, many churches embrace elder services and well-being as part of their mission; a strong and healthy congregation is their goal. More church-based programs like the one noted in the study could go a long way to increasing the health of America’s seniors—and maintaining church attendance. That’s a great outcome for everyone. It also breaks a cycle of fear for seniors. “Older adults, particularly those who have already fallen, become more cautious. ‘They start restricting their activities, which causes reconditioning, and that gets into a vicious cycle,’” writes the New York Times today, quoting Dr. David Thurman, a fellow at the American Academy of Neurology. Those accustomed to regularly getting out the door for church services may be more willing to do so for exercise time with friends. Building senior’s strength and balance while guarding against falls is a key to longevity because it reverses the cycle of declining activity. Marvin has so far balanced his need for continuing activity with a fear of falling, but it’s a tricky and constant task. At his birthday party, as family members ate sandwiches and drank champagne in the living room, I asked him what else, besides wandering from room to room in their apartment, he could do during the cold weather to keep his strength up. “I guess I could walk in circles in the lobby,” he told me. Indeed, on my way to the party, I had seen one elder building resident doing just that. But the circles are small, the scenery is repetitive, and, well, there are neighbors coming and going who might find a circling senior to be annoying. Where’s the fun in that? Marvin’s lack of mobility this winter reminded me that senior health isn’t just about getting to the doctor, eating right, and taking the proper medications. It’s also about a connection between body and mind, which is something church attendance, regardless of the denomination, has always been concerned with. “The Patient Body” is a monthly column that examines the intersection of medicine and religion.